The latest in Judson's best-selling "Work of the Church" series! • What is bivocational ministry? • Where can you find it? 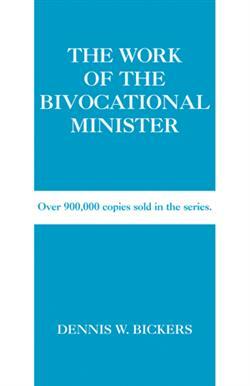 • Who is the bivocational minister? Veteran bivocational minister and author Dennis Bickers answers these basic questions in establishing the work of bivocational ministry. Simply defined, it is the professional ministry of any pastor or salaried church leader who also has other sources of income. Traditionally, it is a ministry that has been treated as second-class and less than ideal, but Bickers celebrates its benefits and rewards, even as he acknowledges its challenges. • What makes bivocational ministry challenging? • What makes it rewarding? • What might a week in the bivocational life look like? Bickers also explores how bivocational ministry can work for the local church—and how it is gaining credibility and appreciation in various Christian denominations. Finally, he shares some practical tools to aid the bivocational minister in the common challenges of sermon planning, compensation, and goal setting. This compact volume meets a critical need in the emergent church as it offers creative and practical insight into a time-tested, if not always honored, paradigm for ministry in the twenty-first century. Special Offer! Purchase The Work of the Bivocational Minister and All Churches Great and Small, and save $5.00 on your order! Enter discount code BIVO at checkout and the savings will be deducted from your total! Dennis W. Bickers worked as a bivocational minister for twenty years. He is the National Project Director of BivoNet, a ministry to the bivocational ministers of American Baptist Churches USA, and also serves as an area resource minister for ABC of Indiana and Kentucky. Bickers is a member of the advisory board for the Bivocational Ministry Center at Campbellsville University. He is the author of three books on the subject of bivocational and small church ministry.